Welcome back to post three of the Suger’s Summer post series. Hello nautical! Regulars here will know my love of stripes. So nautical is kind of my thing. Navy, black, white and red are go to colours for me. Stripe them together and I’m as happy as a pig in mud. So I HAD to include nautical in the series. Styling a nautical look from my wardrobe SHOULD have been easy. It wasn’t. Too many stripes. Too little time. This weekend just gone I packed up some stripes and some red accessories and decided to just go with it. Olivia had done the same with her stash of clothes. Thrown them together into a bag or two of awesome. Let’s just say her Forever 21 blazer and I fell in love. 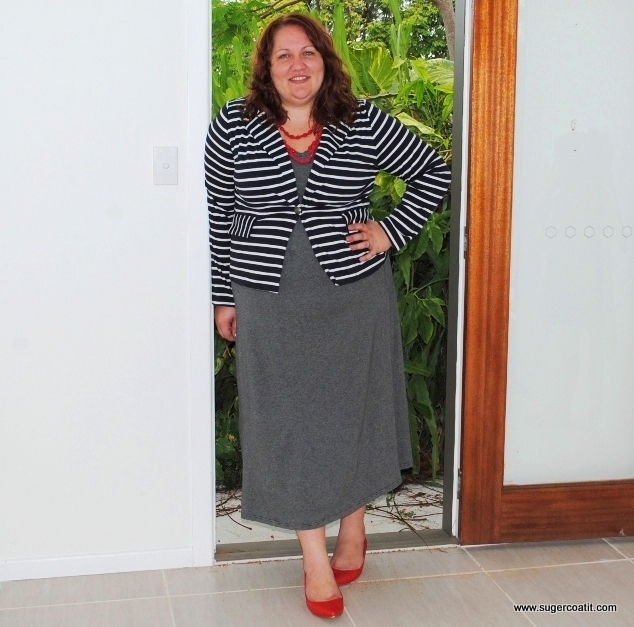 This outfit is made up of the Virtu Bonita Dress, with the Forever 21 blazer, red necklace from Autograph and red shoes from Target. Let me tell you, if you haven’t got a maxi for this summer, go now, get five. At least. The Bonita has a scoop neckline, short sleeves and is a great length. To have sleeves in a maxi is awesome, for a change. Go on. Admit it, stripes are awesome. Always include stripes. A little or a lot. Just include SOME. Stick to the basic colours; Red, black, white and navy. Make the accessories gold. Flats or wedges the whole way. Ditch the heels for this look. Or wear it short and copy this nautical look in a massive stripe overload!